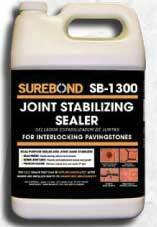 SUREBOND-1300 Joint Stabilizing Sealer is a water-based, single component, epoxy modified, enhancing sealer and joint sand stabilizer. The product can be used both inside and outside, on old and new pavements, sealing paving stones and stabilizing joint sand at the same time. It is the only sealer that can be applied immediately after paver installation, as it is breathable and will not trap the naturally occurring efflorescence. This breath-ability also decreases freeze-thaw damage and improves surface durability and ease of maintenance. 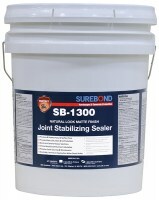 SB-1300 Joint Stabilizing Sealer is solvent free and exceeds all VOC and EPA standards. The product is non-hazardous and has the consistency of water. It is milky white when applied and dries crystal clear, creating a finish that ranges from a matte finish to a satin sheen, depending on the surface. Cured sealer is freeze resistant to -60°F (-51°C) and is stable up to a temperature of 180°F (82°C). The pavement surface should be clean and free from oil, dust and any loose material. If necessary, use SB-442 General Stain Remover to clean pavers (refer to label and data sheet for guidelines). The paver joints should be completely filled with dry, correctly graded jointing sand with the top level not exceeding the bottom of the chamfer or 1/8” below the surface on non-beveled or tumbled paver surface. A leaf blower is the recommended method to remove dust and fine sand particles from the surface and achieve the optimum joint sand height. Remove all visible efflorescence prior to sealer application; use SB-488 Efflorescence and Rust Remover if necessary (refer to label and data sheet for guidelines). Be sure surface is dry prior to application. SB-1300 Joint Stabilizing Sealer should be flood coated to the pavement surface using a siphon pump, bulk sprayer or a handheld garden sprayer. Use coverage guidelines to determine the correct amount of material for the project. Flood joints to ensure proper sand penetration and stabilization and use a soft foam squeegee to direct excess material into the joints and to remove all excess material from the surface. Material coverage will depend on surface porosity, joint size and pavement usage. Care should be taken that no excess material is pooled on the surface. Clean all application equipment with water and do not allow material to dry in containers as removal becomes more difficult.